By way of definition, modular or offsite construction involves, "the process of planning, designing, fabricating, transporting and assembling building elements for rapid site assembly to a greater degree of finish than in traditional piece meal on-site construction,” according to the National Institute of Building Sciences (NIBS) Off-Site Construction Council, Washington, D.C. Additionally, NIBS notes the modular industry consists of two, distinct industry segments: re-locatable modular, referring to temporary structures for short-term use, and permanent modular construction (PMC), which is prefabricated single or multi-story whole building solutions in deliverable module sections. Tom Hardiman, MBI’s executive director, agrees, noting after the recession, many construction workers left the industry and didn’t return. Further, he says the labor situation “is not getting any better— it’s getting worse.” Hardiman predicts when many of these 50- and 60-year-old workers retire, “we’re going to feel the pain when there’s no labor left to build these [buildings]. That day is coming,” he warns. 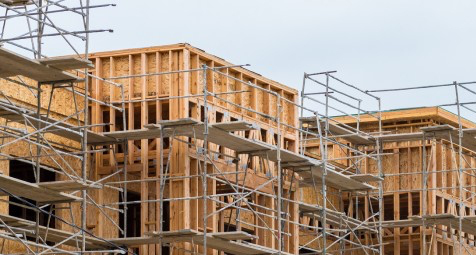 Benefits of Building Offsite Only Show Up When They Hit The Job Site And Can Stay On Schedule And On Many Jobs Today In The Western Region That Is Not The Case. The fact is, offsite construction practices represent a more industrialized and efficient way of approaching building projects with inherent benefits that cannot be ignored much longer. Past and ongoing research comparing the benefits of offsite construction versus traditional onsite construction has proven that modular is advantageous, according to NIBS. Benefits of offsite practices include. * Builders need to beware lots of giant pre fab shops that look well funded still have been having major job site labor shortage. When builders visit these huge automated factory settings it makes everything look super easy and super fast. Fact is many of these new huge wall panels shops in the western region are still having job site labor and vertical framing schedule problems. Biggest problem is when giant framing companies from the eastern regions show up in the west and they think they can handle to same pace they do in the east. The western US buildings are much much harder to frame with all the seismic engineering verses buildings in the east. The framing companies in the west have fought this pre fab stuff for years but only know with there own labor shortage are they starting to either work with the builders pre-fab shop or they set up there own framing tables off site to pre-fab there own. At the end of the day walls are easy especially on today’s type of buildings but the floors and earthbound threaded rod systems still have to be done on-site. For the builders that read this blog the best thing you can do today is to check the references o other jobs the pre-fab shop and job site framers are doing to see if they doing what they are promising. If you can not find perfect framing company that can keep your job on schedule than I suggest you break your building up and give sections to different companies. I have been in this business for 45 years and yes things changed after the collapse of 2008 so my suggestion is to break the jobs up to multiple framers. No matter how big the pre-fab shop is check in with there last two jobs and see if there big funding is really helping them out here in the real world on the job site. Best Pre Fab Shops own the job site labor and are proud to have you call there references and go see jobs they are currently framing.